Be the first to share your favorite memory, photo or story of Lorraine. This memorial page is dedicated for family, friends and future generations to celebrate the life of their loved one. 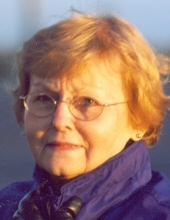 Lorraine J. Umlauf, 82, of Lapeer, went to be with her Heavenly Father on Saturday, February 2, 2019. Lorraine was born August 5, 1936 in Detroit to Leonard and Josephine (Zawacki) Ciaglowski. She graduated from Holy Cross High School, class of 1955. Lorraine married Robert H. Umlauf on June 23, 1956 at St. Mary’s in St. Clair, Michigan. Lorraine & Bob have been devout members of Immaculate Conception Church in Lapeer and St. Clement Catholic Church in Romeo. Lorraine was a loving wife, mother, grandmother and great grandmother. Family was everything to Lorraine. Lorraine is survived by her husband of 62 years, Robert Umlauf; children: Deborah (Mike) Aude of Washington, MI, Daniel (Sandy Reed) Umlauf of Midland, Kevin (Donna) Umlauf of Bellingham, MA and Keith (Meghan) Umlauf of Holliston, MA; ten grandchildren; four great grandchildren and her sister, Lee Kelderhouse of Cocoa, FL. She was preceded in death by her parents, Leonard and Josephine Ciaglowski. In lieu of flowers memorial contributions may be made to the Lapeer County Medical Care Facility (Suncrest) ~ Heritage Gardens, 1455 Suncrest Drive, Lapeer, Michigan 48446. Visitation will be from 4-8PM Wednesday, February 6, 2019 at Muir Brothers Funeral Home, Lapeer. The Rosary will be prayed at 7PM Wednesday evening. Funeral Mass will be at 11:00AM Thursday, February 7, 2019 at the Immaculate Conception Church, 814 West Nepessing Street, Lapeer, Michigan 48446. Lorraine’s family will receive friends at church from 10-11AM the morning of the service. Co-officiates Father Brian Hurley and Father Richard Bartoszek will preside over Mass. Cremation services will follow Mass and have been entrusted to Muir Brothers Funeral Home, Lapeer - burial will be at Mt. Loretto Cemetery, Lapeer. Please visit MuirBrothersLapeer.com to leave a remembrance or condolence. "Email Address" would like to share the life celebration of Lorraine Josephine Umlauf. Click on the "link" to go to share a favorite memory or leave a condolence message for the family.